Legends of Medieval France and Italy: Bonne Chance France en Coupe du Monde de Rugby! Before the game begins, I wanted to go on the record and wish the French national team good luck in their match today against Argentina in the second to last match in the Rugby World Cup. I will admit that I do not understand much about the game of Rugby, but after being in France during September I was surrounded by Rugby Fever. We were in Paris the night of the first match which was France versus Argentina in Saint Dennis at the Stade de France. The energy was palpable. We heard horns blaring from rugby fans as France scored, and later we did not hear any more cheering. I took that as an ominous silence. After returning to our hotel room we caught the end of the game and realized why we had not heard any more jubilant cheers. France was behind. They never caught up. The first game that opened the Rugby World Cup had the host country France losing. I found that to be sad. During my stay in France I had the opportunity to watch many of the rugby games and found it far more exciting than American football games. It is brutal, the game hardly ever stops, and no one wears padding or helmets. I watched in amazement to see multiple passes, tackles followed by multiple passes and more tackles without the game being stopped. There would be pauses in the play, but definitely not like American football where there is more time waiting for the play to happen than the plays happening. American football constantly is stopped with each tackle or incompleted pass with officials regularly coming out to the field and measuring whether or not sufficient yardage was achieved. Rugby you just keep playing. To me, that is far more exciting and I wish that the game were played more in the U.S. than it is. One thing that I do not understand are the fouls. The game itself looks so violent that it was surprising when no fouls seemed to be called due to physical contact that in at least basketball would be considered a personal foul. Later when a foul was called I could not recognize what had happened that was necessitated its being called that had not been needed before. I can understand the appeal to watching rugby as a sport more than I can soccer (also known as non-American football.) That game is not as appealing since the scores are so low. I do not find it as exciting to just watch people run around the field. In rugby, they are not only running, they are tackling. As I watched the French team, my eyes were drawn to one player. Whenever he was on the field I watched him and not the ball. That player? Sebastian Chabal. He may not be the best rugby player, for he does not seem to have the stamina to play for the entire eighty minutes of the game, but he is the most captivating. I could almost smell the pheromones rolling off of him. I watched him score in the game against Namibia and he simply would not allow himself to be tackled by his opponents. He plowed through them as if they were children and not full grown men. I was not alone in finding him irresistable. Some of the television commentators gushed about Chabal and said that he was a national hero. They also showed how YouTube videos were now springing up paying homage to the him. Here are a couple of examples of Chabal in action on YouTube. His shoulder length hair, full beard, and fierce demeanor led commentators to spend a lot of their discussion about Chabal's looks. One said something about his dreadlocks. Umm, no. He does not have dread locks. He has sweat locks. In other words, his hair may only look like they are fasioned in dread locks but that is due to his sweat. He was also refered to as a Gallic caveman. 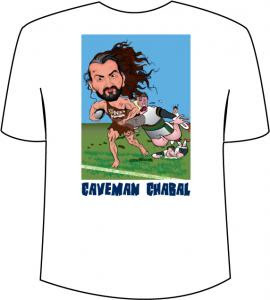 There are even T-shirts for sale with Chabal as a Caveman. I am sorry, but I categorically disavow using the Cave Man Icon to describe Sebastian Chabal. Think tribal chieftain, or my personal preference is Frankish warrior. I knew that going to France would help me to finish my novel, but I did not expect that watching a sporting event would cause me to rethink my characterizations. My mental image of Orlando is now Sebastian Chabal. I would not be surprised if Chabal is cast in upcoming movies, because he is so eye catching. Hollywood? Give him a call. He speaks English and contrary to what sports commentators would like you to believe, he's sounds intelligent as well as a fierce athlete. The other aspect of my story was influenced by my physiologic response I felt in watching him. I realize now that after a major victory in war that women might respond similarly to those who proved themselves worthy on the field of battle. I am not talking about conquered women, but instead the women who were on the side of the victorious army. This led me to rethink a scene that I had written with Rinaldo and I added a chamber maid wanting to show her gratitude and avail herself of his powerful energy. It changed what to me had been just a transitional scene into one that revealing character and human nature. It also shows once again that the image of the Chivalric Ideal is something few if any warriors ever lived up to, if they even tried. The scene has now come alive in ways I would not have expected. Thank you Chabal, and bonne chance France! Yes, I am officially a Francophile. I like rugby. A lot! Welcome to the club! One of the reasons that makes rugby extremely interesting is the absence of stops like it happen in American Football. This is due to the fact that Rugby and Soccer were born at the same time. So, some of the basics are similar. As for the low scores in Soccer: that is why a goal in a soccer game is celebrated like in no other sport. Big Smile!! Thank you for that quick summary. In regards to being "off sides," I think I would have to see it in slow motion replay to see exactly how that works. I know in American football that if the Defense starts moving before the snap that it is offsides. It can be a five yard penalty. As for "violent behavior inside the formation," yeah, that is the rub. A lot of the interaction I watched on the field looked pretty violent. It made me wonder why some acts were considered fouls when others were not. I did see in one game, I believe it was Ireland vs. France when a player deliberately stepped on Chabal when he was on the ground. Walking on someone with cleats is never acceptable, and I am glad it was punished. In fact I was surprised to hear once about "the sin bin" where a player was banished for a period of time. It reminded me of hockey and then I began to wonder why more players were not sent into the penalty box. It happens all the time in hockey. All the time. And as for number three. Huh? I have no idea what that means. I did like the idea of almost continual passing, but that you had to pass to a team mate that was behind you and never forward. The other thing that I loved, but did not understand at first was the placement of the ball for the extra points after a goal. Having to kick at an angle adds a challenge to the kicker and also an attempt by the runner to pass the goal line in a different place. That adds complexity to the game. I like that. Too bad the NFL would never consider changing their rules to follow rugby in that manner. As it is, the only American football games I care to watch is my college alma mater and even then if it gets painful...I wind up leaving the room. I know you enjoy playing soccer, and please do not let my lack of enthusiasm spoil your fun. The games that I watched last year with the World Cup just did not keep my interest. I would rather watch basketball or hockey. Hockey generally has low scores like soccer, but I find it more exciting. Not that I play any of them mind you. I am glad you enjoy my posts. As for Sebastian Chabal having a website, I do not think so. I have Googled his name several times and there does not seem to be any official websites. I tried typing his name in for a simple www.sebastianchabal.com and it is a placekeeper advertisement but not an official site. I am sorry to hear that my links did not work for you. Perhaps you could just try going to Google.com, plug in his name and use the Image search. Just to see what I mean. He is a big man and very strong. In fact during the game against England he broke someone's jaw. Upon reviewing the film from the game, the officials and a judge determined that it was an accident and not a deliberate act. That just goes to prove that the sport that looks brutal to spectators can be brutal to the players.